This summer we worked with Mimi Onuoha and Diana Nucera (a.k.a. 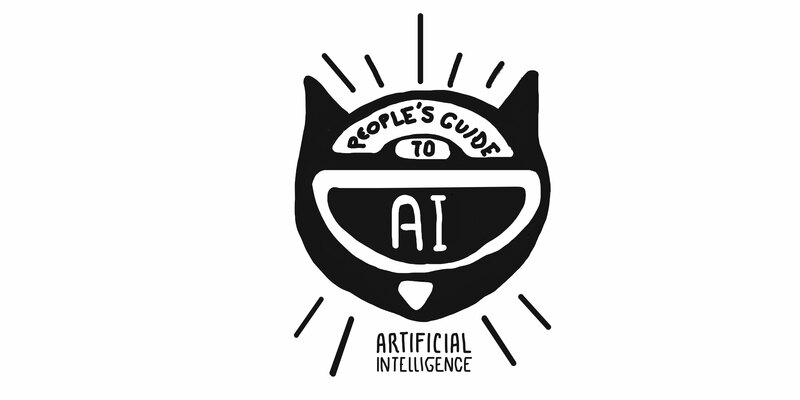 Mother Cyborg) to design “A People’s Guide to AI” — a popular education zine about artificial intelligence. For me, just hearing the words “artificial intelligence” was intimidating, as I knew little about the subject. However, when I heard we would be working with Mimi and Diana, I knew that designing this guide was going to be a fun and exciting process. Representations of AI usually feature high-tech and cold scenes, which can make the average person feel like they will not be able to understand AI or have any influence on how it is used. Mimi and Diana wanted to send a different message: that AI can be complex but, also is cool and exciting, and we can change the future by understanding it and shaping the ways these tools are used in our communities. So, our team strived to make AI look more accessible and understandable. 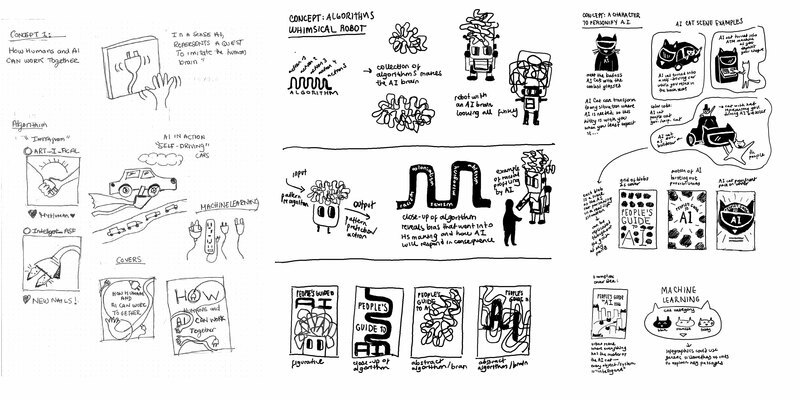 Since a lot of our projects can be difficult in terms of subject matter, developing sketches for the zine was something that our team really enjoyed, as part of our mandate was to make learning about AI look fun. To explain the different concepts, we created “Cyborg Kitty” to represent AI, and a “Human Kitty” to represent humans. Each of the illustrations we created depicted scenarios of everyday interactions between humans and AI, from going to the ATM to listening to music on Spotify. 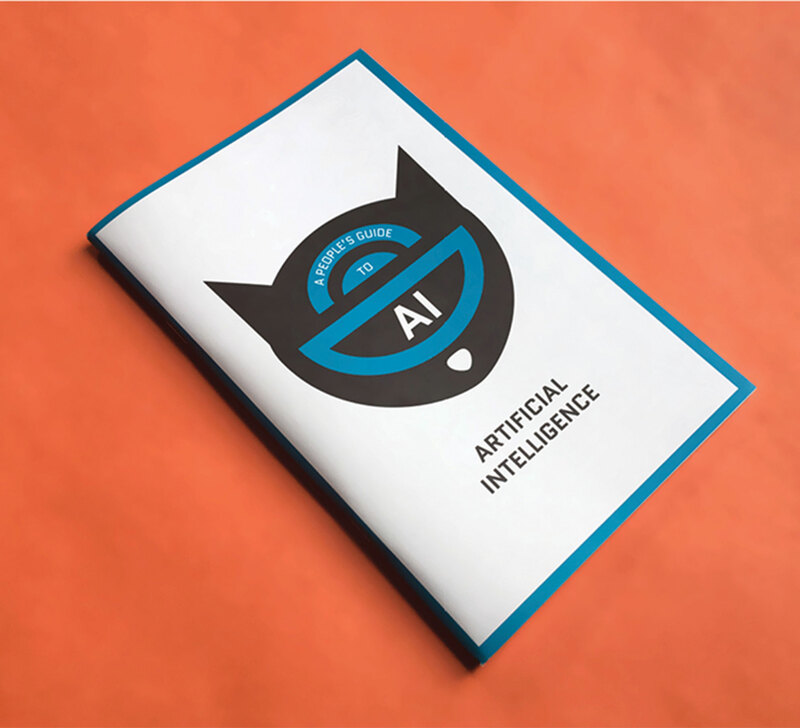 The cat characters served to make AI approachable: to demystify the idea that only people who are in tech can have a relationship with it. This concept also represents that AI is not in and of itself bad or good — it depends on the situation and who is using it. Meaning it can be used against us by government or corporations; or it can be used by us for the purposes of liberation, where we can get involved in the making of AI that serves the needs of our communities. 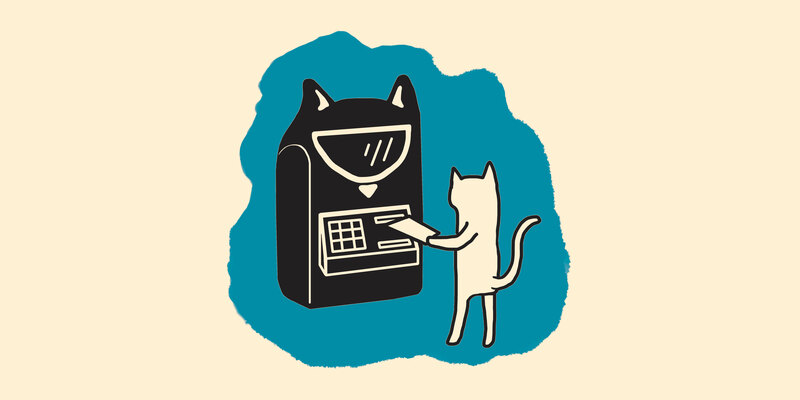 Human cat depositing a cheque at an artificial intelligence ATM machine. A People’s Guide to Artificial Intelligence critically imagines alternatives of how we understand, critique, and embrace AI for the future. We’re humbled and honoured to have been a part of something so important.